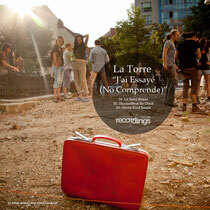 With 2012 proving to be somewhat of a breakthrough year for East London producer La Torre, his first release of 2013 sees the unveiling of the record that arguably kicked it all off for him over two years ago, 'J'ai Essaye (No Comprende)' on Stripped Recordings. It was at the back end of 2010, when La Torre handed the pre-master of the track to Sasha, that things started to move. Despite limited expectations, rumours that Sasha had started to hammer it were confirmed when a set at Ministry Of Sound was posted to Soundcloud. Taking the opportunity to answer ID requests anonymity faded and the wheels were in motion. At that point, only Sasha possessed 'J'ai Essaye (No Comprende)', now, two and a half years after it was produced, the single finally sees the light of day along with a pair of remixes by ThermalBear (conveniently named Sasha's tip for producer of the year) and Richie Hawtin's choice for breakthrough DJ/producer for 2012 Dexter Ford. The track’s already supported by DJs such as Sasha, Maceo Plex, Richie Hawtin, John Digweed, Hernan Cattaneo, Terry Francis, Sandy Rivera, Nick Muir, Kevin Shiu and Kassey Voorn to name a few. It’s out now, have a listen below.